Summertime! And the living is easy! And the drinking should be, too. This Trader Joe’s Cheap Wine Pick is one of my favorites, and has been a staple of my summertime tippling for several years. I first discovered Vinho Verde when I lived in New York, and it was one of my favorite wines for a New York summer. Nothing cut through those muggy days like a nice cold glass of vinho verde – super crisp and refreshing, with d just a few bubbles. When I moved back to LA, I was thrilled to find this great (cheap!) Trader Joe’s Vinho Verde for only $3.99! (Though I think the price has gone up this year to $4.49). Vinho verde originates in Portugal, and refers to a region and a style rather than a specific grape. Vinho verde wines are made with very young grapes (hence the nice acidity you will find in most vinho verdes) and have a slight sparkle to them (that wikipedia tells me originally came from malolactic fermentation, but is now usually a result of artificial carbonation.) 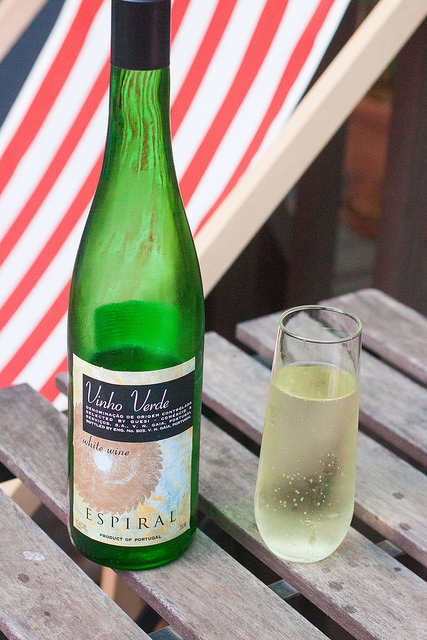 It’s low in alcohol – the Espiral Vinho Verde is only 9% ABV – so it’s great to drink in hot weather without getting that sticky feeling you can get from too much of the hard stuff, and it’s a nice mixer for some of the lighter summer wine-based aperitifs, like a kir. It’s nice citrusy flavors pair well with a lot of summer food – fish, grilled chicken, tomatoes, pesto, pasta. This Trader Joe’s Vinho Verde is eminently quaffable! I agree! What an amazing find.